Welcome to the website of the Chinese Foreign Ministry! As the new Foreign Minister of China, I would like to extend, on behalf of all my colleagues at the Ministry, our warm regards and greetings to you! China is an important member of the international community. We need to know more about the world and so does the world about China. The Foreign Ministry website is ready to open a window for friends both home and abroad. From this website, you will not only have access to rich information on China's foreign policy, diplomatic activities, foreign affairs knowledge and consular services, but also know more about a China that is making constant progress and with a bright prospect. A bosom friend afar brings a distant land near. China is ready to be a good friend and good partner to all countries in the world. China's diplomacy will hold high the banner of peace, development, cooperation and mutual benefit. We will spare no efforts in practicing the concept of "putting people first" and "diplomacy for the people" and firmly uphold China's sovereignty, security and development interests. We will go all out to safeguard the legitimate rights and interests of Chinese citizens and legal persons overseas. China will continue to pursue the win-win strategy of opening up and grow friendship and cooperation in all fields with other countries on the basis of the Five Principles of Peaceful Co-existence. We are ready to assume our due responsibility and make unremitting efforts to build a harmonious world of enduring peace and common prosperity. Once again welcome to the website of the Chinese Foreign Ministry. Thank you for your attention and support to China's diplomacy. We hope that you will visit us often when you have time and leave us with your valuable suggestions about our work. Wang Yi, male,Han ethnicity, a native of Beijing, was born in October 1953. He began his first job in September 1969 and joined the Communist Party of China (CPC) in May 1981. Wang graduated from the Department of Asian and African Languages of Beijing Second Foreign Languages Institute where he completed an undergraduate program in Japanese. He also holds a Master of Economics degree. Wang is a member of the 19th CPC Central Committee, State Councilor, a member of the Leading CPC Members Group of the State Council, and Minister of Foreign Affairs. 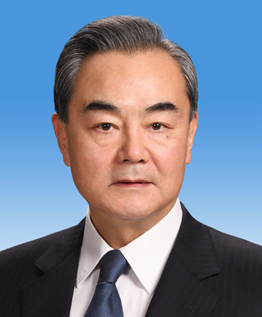 Wang has been a member of the 17th through 19th CPC Central Committees.